Street Food. This word brings in a unique sort of sensory overload in anyone who has ever eaten street food. Ho Chi Minh City is filled to the brim with a cross-section of delicious, cheap and authentic meals that are also conveniently located all close together. Ho Chi Minh City has got a plethora of all varieties of local Vietnamese dishes for you to indulge in and to immerse yourself in the local food experience. Co Giang Street marks the end of the backpacks district of Ho Chi Minh City. The area is relatively quiet, and the food stalls are placed at comfortable distances from each other. The street is known for its somewhat 'authentic' and 'Vietnamese' style of food, as compared to other areas in the city. As the sun sets, the streets are illuminated with fluorescent lights, and you can hear the sizzling of the barbecue, whooshing of the woks and bubbling of the cauldrons as the scent of freshly cooking food hangs in the air. The best food in this street is the bo la lot or beef wrapped in betel leaf. Some other delicious meals you get in the area include Banh Tham Bi or 'Silkworm Noodles', which are merely tapioca noodles coated with thick coconut sauce, sautéed vegetables and pork and Bun Bo Hue, a soup made from lemongrass and Chilli, Laden with thick cuts of meat and spiced with paprika. Nguyen Thuong Hien Street maybe a narrow and dimly lit street but there's a lot to eat and drink on the street and a lot of fun to be had! The street paints a somewhat odd picture - hundreds of diners sitting in the sidewalk, munching shellfish and washing it down with some local beer. There are also locals and musicians who bring their guitars and you will numerous groups of people singing along to the acoustic guitar. The seafood at Nguyen Thuong Hien Street is famous. Oysters, Clams, Crab Claws and Sea Snails are traditional cuisines here. It is also quite renowned for fresh fruit juices, and tropical fruits are freshly squeezed to make juice. Hu Thieu Nam Vang Noodles are a no-miss here. These noodles are made of slices of pork, whole shrimp and quail eggs in a clear sweet broth seasoned with shallots, spring onions and kale, and are mouthwatering. The long, winding lively Su Vanh Han Street is often referred to as 'The Ghetto' owing to a large number of Soviet-Style buildings present. The street is jam-packed with Grey, Old dilapidated buildings which stand in stark contrast to the surrounding nightlife. The street is filled with all kinds of people - young, old, Vietnamese, foreigners, all of them rushing to one of the numerous stalls the line the street side or seated on one of the plastic stools, munching on their delicacies. This street is renowned for its banh xeo, savoury crepes filled with pork and bean sprouts and cooked over a flaming barbecue. Another favourite dish is the mi Viet tiem, egg noodles with duck served in a profoundly aromatic broth. At the end of the street is located a unique dessert stand which serves 16 different Vietnamese desserts on a platter. The desserts are made of rice and coconut milk and are gooey and colourful. 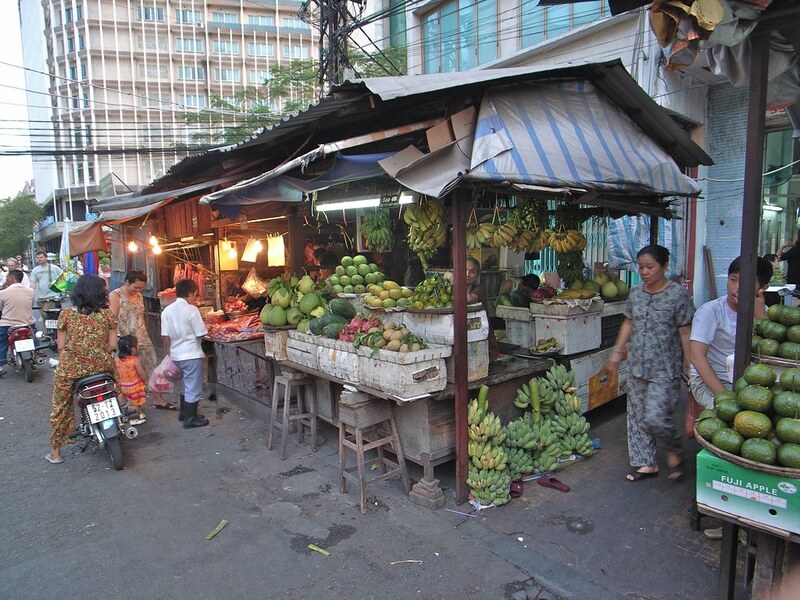 Phan van Han street is lined with cheap food stalls frequented by students from the nearby universities and locals. Space is sparse, and the streets are packed with food vendors and buyers alike, all clamouring for space. The naked fluorescent lamps cast shadows over the various shellfish and snail stands, banh xeo stalls and soup vendors net to the stuffed houses, painting a stark contrast against the glitz and glamour of the nearby Saigon City Center. Between 6:30 PM and 8 PM, this area is overflowing with people. Some of the best food here include - bot chien, fried rice flour cubes, mi vit tiem, fresh yellow noodles with aromatic duck and Banh Da Xuc Hen, a large rice paper crisp with hints of sesame and coconut, with a tiny pile of clams fried in lemongrass underneath it. Van Kiep Street is a thrilling exhibition of street food in Ho Chi Ming City. Located at the intersection of two prime districts, this street has the unique feature of being the street that showcases almost 90% of Vietnamese street food, all within hundreds of meters. Each street stall has huge neon boards displaying a list of foods they serve. This area is filled with the young crowd, huddled along plastic tables and gesticulating and laughing wildly. The vibe of the place is lively, and it is a great location to spend an evening observing Vietnam's culture. The street has some of the best Vietnamese street food. 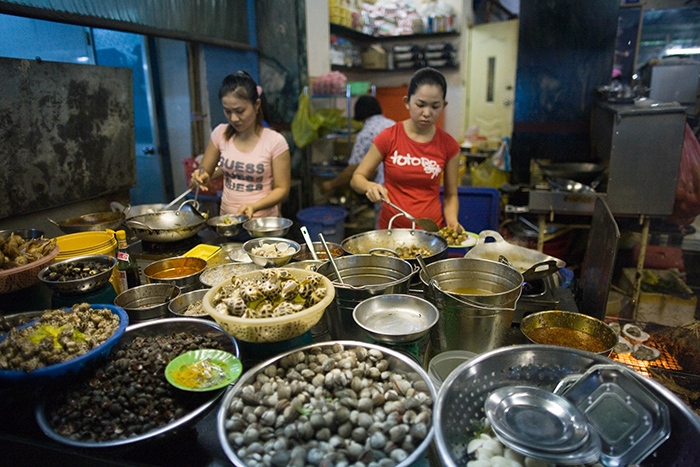 Among those, the must-try foods include - the spicy marinated octopus, which is grilled over an open barbecue and whose smell wafts around, tempting all those who pass; bun mam or seafood noodle crammed with wholesome ingredients and banh canh cua, a fishy slippery noodle special to the southern part of Vietnam. 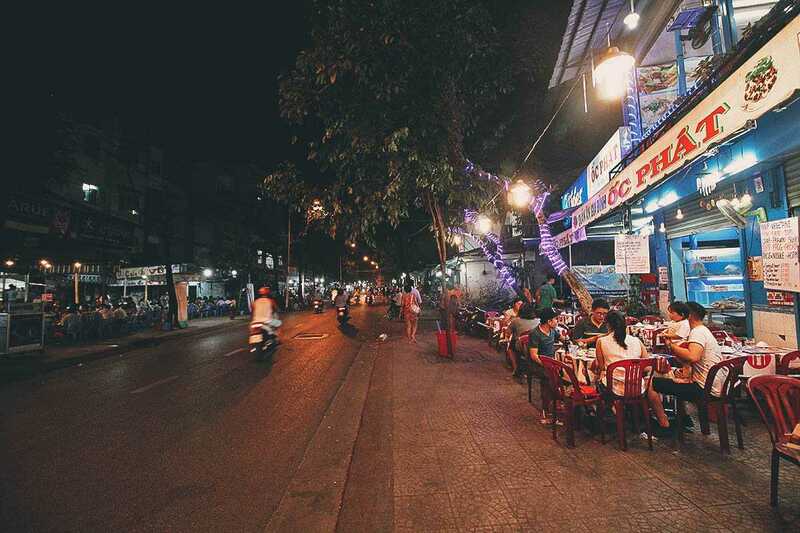 Vinh khan Street is loud and noisy street to enjoy Street Food in Ho Chi Minh City. It is a vibrant and glorious celebration of food. Every night, young crowds flock to this street dressed in glitzy and fashionable clothes, tattoos and wearing elaborate hairdos. To add to the thundering cacophony produced by the crowd, a gang of raucous youngsters ride in every night in their motorcycles, with large amplifiers strapped to them and belt out the karaoke music for the crowd. To add to this, there are fire eaters and street dancers. This is the place to be if you are young of heart and enjoy a good party coupled with great food. This street is known for its seafood and shellfish. Oc Huong Ran Moui Ot (fried sea snails with salt and chilli), So Diep Muong No Hanh (grilled scallops with spring onions and peanuts) and suon heo ngu vi (pork ribs in five spice marinade) are the most popular kinds of food. Another speciality of this area is grill-it-yourself meat. A coal stove is placed on your table on which you can grill your chunks of marinated beef, pork, goat and fish. Often described as an open wardrobe of food, this street is filled with such a wide option of food that it is better to let your nose and your foodie instincts guide you. The local people know exactly where all the good food is here and it is advisable to take along someone who is familiar with the street. The street is a chaotic jumble of motorbikes, cars, pedestrians, food vendors, and diners on the sidewalks devouring their dinners. Some of the best food to have here is Banh Canh Hua, a slippery, slimy concoction with thick doughy noodles and fresh crabs and banh Xeo, savoury rice pancakes. A speciality of this street is the moving grilled meat trolleys which are extremely difficult to pass up. This street is also famous for its pomelo juice. Ho Chi Minh City has a glamorous nightlife, but its real authentic charm lies in the streets ? in the food, the people and the rich culture seeping through every pore of the city. Go on, take a bite out of Ho Chi Minh City and I promise you will not be disappointed. Hit the streets and eat away! Here is a list of fun things to do in Ho Chi Minh City for FREE!